One day you’re hammering nails and buffing counter tops, the next day you’re watching the ticket sales counter go up, up, and further up. Reality has a way of creeping up on you. It doesn’t take much to tip the scale, and you can’t predict when it’s going to happen. Where something transitions from an idea to something concrete. Or, in our case, a place for sharing ideas made out of concrete. 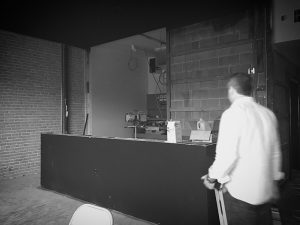 We went from working in a mostly empty space to visualizing lines out front, the distant thump of a show going on inside, leaning on the Burn Box bar as you get your glass of wine. And all the color, sound, and spectacle of your favorite act taking the stage. We’ve had plenty of those “this is real” moments. And who knows how many more we’ll have? All we know is that it’s damn fun every time it happens, and it’ll be the most fun when it happens (pardon the pun) for real. So get your tickets and join us for the real thing in January. Less than three months to go.